"Another visitor. Stay awhile. Stay forever!" The first computer with reasonable scene activity was the Commodore 64. The reason for the popularity of these microcomputers was the great number of games published for them. The Commodore 64 matched the quality of game hall arcades on the field of sound and music, but it also bet the game consoles of the time, which were not user programmable, and most importantly, console games were not easily copied. Of course, everyday people could not afford buying a dozen of games every week, just to shortly get bored of them, and go back to the shop for new ones. It's hard to understand why software houses expect us to do this nowadays. When one purchases a software – be it a utility or a game program – we can only see the beautiful, shiny box, which promises eternal fun for the customer's money, but the real thing only comes to light at home, when we find the expensive software unusable, or the game boring and ugly. Eternal games of old times: Choplifter, Impossible Mission, Barbarian, Space Taxi. These simple games sometimes gave us a lot more fun than those six-CD multimedia wonders of the nineties. Returning to back the history of games: At the beginning of the eighties it was completely acceptable to use pirated software. When someone purchased a game on floppy disk or cassette, he copied it to his friends, just like a regular audio cassette or record. The only difference was that the software did not lose its quality after each copying, so one copier could spread a program widely. At the dawn of the microcomputer age, when people first started computer clubs, they all copied the newest games for each other. These clubs saw the first hackers, advanced users creating software on their own, like games, utilities, first in BASIC, later, when documentations became available, in machine code language. Machine code, or assembly greatly increased the speed of the program, as the code was not running with the help of the slow BASIC interpreter, but directly accessed the computer's processors. An assembly code on the Commodore 64 ran around thirty times faster than a BASIC program, not mentioning that many functions, like those dealing with graphics, were inaccessible from BASIC. Soon the society of hackers was born. A group of people who solved tasks on their computers which required very sophisticated programming knowledge. Sometimes these people discovered new solutions for even impossible tasks by finding undocumented functions. The history of the scene started when someone went to a hacker in a club and said: "Excuse me, I heard you're very good in programming. I can't complete the 34th level of this game, because there is a red monster that always kills me. Can't you do something and remove that monster?" The hacker shrugged his shoulder, disassembled the game and removed the obstacle. The gamer was happy - he could complete the level - and by the way, the term cheater was born by him. The hacker became a cracker, and regularly started to modify games brought to him. Soon he even started disassembling programs for his own fun, cracking as they named it, and soon the clubs saw some games starting with questions like "Do you want unlimited lives?" Not meaning that the crackers even found the secret of eternal life, but if the player wishes to keep playing the game when dies, without seeing the annoying Game Over all the time. These modifications were later named trainers. When there was no need for such an option, still the cracker found it funny to decompile the code, just to write "Cracked by XY" or similar on the startup screen. Soon this became fashionable in the cracking scene. Games appeared with such short messages in increasing numbers. This soon made some companies worried about perhaps losing millions on these crackers, and called for the law to end this movement once for all. By the middle of the eighties law banned disassembly, modification and duplication of commercial software in Western Europe and the United States. But the crackers knew from the beginning that someone someday will surely not like what they're doing, and hide behind nicknames. This is the origin of the usage of English or English sounding handle names on today's scene. In the beginning most members of the scene chose a three letter name, as the high score table of most game arcades of the time was only capable of storing three letters. Another heritage of the eighties' scene today is the so-called elite scripting. When the American crackers started to use legal informatics communication systems for their communication, such as modems, networks and telephone lines, naturally FBI immediately tried to track their traffic and find the software pirates. This was because some cracker groups already discovered the great opportunity to make easy money with cracked software, and committed true computer crimes. These hackers found a very easy way to beat FBI's filters. As the listening computers were looking for certain words, expressions among the electronic traffic, crackers simply stopped using suspicious words. For example they never wrote the word wares, which was a term for pirated software, but wrote warez instead. On this pattern they changed a lot of other dangerous words, usually changing every s to z, or kz to x, o to 0, and soon even warez became w4r3z. They almost never used the same word twice in the same form, and soon they did not even change letters to similarly pronounced ones, but even added characters that were not Latin letters, just shaped them. For example, A was replaced with 4, or Ä, or anything similar. Sometimes the word was so distorted that it wasn't even similar to the original. Like hacker became haxxor, or h4xx0r, elite became eleet, eleete, even 313373, and it's really a cool computer or smart FBI agent who can recognize this. This traditional elite scripting, the electronic argot is still being used nowadays, even by people who were never involved in any illegal activities. If it's not yet clear, this book is titled Freax for the same reason. Who was the first cracker? This story outdates even game programs, as it happened in 1975, in the Palo Alto Homebrew Computer Club, in California. This club is of special importance not only because Steve Wozniak and Steve Jobs first introduced the prototype of the Apple-I computer here, but that it was a preferred meetplace of hackers and phreakers of the time. The world's first software piracy act was committed by the members of this club in June 1975. The software was a BASIC compiler for the Altair 8800 computer. 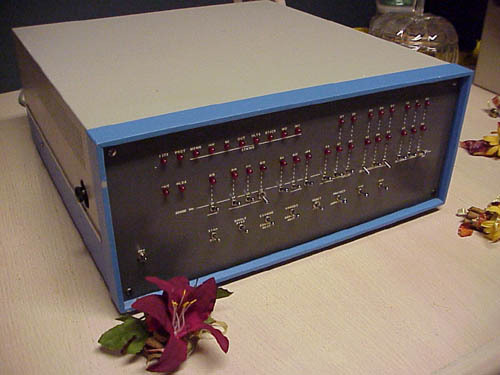 A club member brought the source code of the program in printed form from Model Instrumentation Telemetry Systems, the manufacturer of the Altair computers. The author of this BASIC compiler happened to be a 19 years old young man, named Bill Gates. He immediately broke out in fury when he learned about someone copying his software, and immediately sent a furious reader's letter to many computer magazines and other forums. He called for the trade's disregard of illegal software duplication, demanding it to be declared a crime, thievery by law. No one took the ridiculous kid serious. The letter was barely published anywhere, and some magazines who did, all commented it in a vitreous mood. A couple of years had to pass until they really criminalized software duplication and modification. We have to add that Bill Gates has been very angry with hackers ever since, and as he's the richest person of the world. Nowadays he puts great efforts in trying to make hobby computing disappear. For example in 2000, now as the chairman of Microsoft Corporation, he addressed the American government to declare hobby programming and studying of computer sciences illegal, because it risks the interests of software companies. Perhaps this is what they call unassimilated teenage frustration. As a matter of fact, Bill Gates himself admitted that he needed a psychiatric therapy during his teens. Even nowadays he is a typical nerd, who knows a lot about computers, but nothing about life. Those who know him personally describe him as an anxious, paranoid person, who handles others conceitedly, giving the cold shower on them. As George Grayson, founder of Micrografx said: "I half-jokingly say there is only one person with fewer friends than Saddam Hussein. And that's Bill Gates." One thing to mention about the Altair 8800 itself is that most likely it was the first computer ever running a demo. For our today's eye it's an incredibly primitive machine, it didn't even have a monitor, only a few lines of blinking LEDs, which gave feedback about the status of the running program. How could they possibly write anything like a demo for that? Someone found that the working computer generates an electromagnetic field that interferes with radio communications. So he placed a pocket radio on the top of the machine, and started to display different numeric values with the LEDs. At each number the electromagnetic field changed, so the pitch of the radio's noise did alike. By blinking the LEDs with a certain speed and order, the computer and the radio produced primitive music. Now let's return to the Commodore 64. This computer happened to be very popular in the eighties, and spread across the globe very fast. Soon a huge amount of games were available, and many were cracking and copying these. MWS, member of the cracker group Radwar Enterprises wrote these lines in 1988, in the regularly published underground fanzine, titled Illegal. Think back! What was the very first game you ever saw on your 64? Probably Commodore Soccer, which was cracked by a German guy called 1103, who also cracked other Commodore modules. Or M.U.L.E. from Electronic Arts cracked by Oleander? Or Hard Hat Mack by OTD? Or Summer Games by JEDI? Something like that, right? This all happened around 1982, other famous groups at this point of time were Antiram who cracked games like Dallas Quest, Pogo Joe, Miner 2049'er, Raid over Moscow... or the first ‘cracking service', namely the German Cracking Service, who released games like Activision's H.E.R.O. or Saxxon, Slamball and Flight Simulator II. These groups formed cracking around 1982 and 1983. Beginning 1984 lots of new groups raised their power, some of which were TBC who cracked Kennedy Approach or Crackman Crew with F-Copy III, Heart of Africa, and they were the first who fixed American games to the European PAL system, among them Ballblazer. The first English groups were Yak Society, who cracked almost every Elite game (remember Frank Bruno's Boxing) and Teeside Cracking Service. 1103 has now an own company, working with PCs and bigger machines, but he also converted Quiwi by Kingsoft on the Atari ST. Oleander works also on PCs, OTD developed the ProLogic DOS and all together developed the F-Copy III. F16 from Section 8 made the F-Load 3.0 and Copy+, and works now for Discovery Software. The first cracker group's name, JEDI was an abbreviation from the members' names: Oliver Joppich (OJO), Oliver Eikemer (1103), Oliver-Thomas Dietz (OTD), and I stood for Inc. Other crackers worked alone, like E.C.A. 1998, but just like the members of JEDI, he also worked on legal projects, like development of games and user software. E.C.A. was the cracker who invented the term release, as he was the first who distributed – released - his cracks nicely packed, with trainer attached, under his own cracker handle. Kotzbrocken was actually two persons: Karsten Schramm and Boris Schneider. Schneider's name might be familiar for some, as he wrote the most detailed book about the programming of the Commodore 1541 floppy drive. Another ancient group, which MWS also mentions above, was Antiram, who were already on the scene in 1983. This group consisted of several independent members, led by Andreas Arens, who later created a lot of games and utilities as a programmer of Kingsoft, a German software company. Today these first crackers almost all work in the computer industry. They displayed so high a level of technical knowledge during their cracking activities that they vastly outmatched the experience of most companies programmers. Maybe it's enough that the game software company Epyx was officially selling the version of their famous Summer Games in Europe which Jedi converted from NTSC to PAL. The cracker scene was flourishing around 1985. New groups were formed worldwide. A kind of competition arose: who can crack a game faster, who can display his name more beautiful to the title screen? This competition soon led to these names disappearing from the games themselves and they created individual programs, which ran first before the game was executed. These programs displayed the cracking group's name with spectacular graphical effects and music. These were the cracker intros, also referred as cracktros. They were mostly alike, as they were all made for the same purpose. They weren't yet made for an artistic purpose, but just wanted to tell the world that someone was here and cracked the program. The strengthening competition led to better and better cracktros, with smarter effects and more stylish music. The general cracktro format was the following. The group's name or logo was standing in the middle of the screen, or sometimes waving, bouncing, rotating, etc. Under, over, behind or somewhere there is a scrolling text running, sometimes also not simply running, but twisting, waving, sometimes mirrored on the other end of the screen. This tells the history and date of the crack, and then comes the obligate greetings to other teams. Sometimes the contact address of the cracker was also in the scroller, but not for long, as not only the police could read it, but also little kids whining for free games. Instead they would usually hide the address inside the intro, which was only accessible by disassembling the code, meaning that only another cracker was able to read it. The first cracker groups making intros were German Cracking Service (GCS), ABC and Bert from the Netherlands and Danish Crackers. GCS was the first to employ moving sprites in their intros, and BERT was the first to add sprite animation. BERT’s intro from 1985. It looks very primitive compared to later intros, but it was a serious achievement in its time. The four letters, individual sprites each, moved in from the top of the screen, sliding on each other, giving a slight illusion of a 3D rotating text. Then the letters stopped, text was displayed under them, and the screen border was suddenly engulfed in colorful noise. By 1985, the cutting edge of the scene consisted of 5-6 German, 2-3 Danish and 3-4 Holland groups. Cracking games was not too difficult yet, as most of them had no protection at all. It was only a matter of saving the contents of a game cartridge to disk or tape. A program called ISEPIC was a widely used tool for this purpose. Later freezers appeared, devices which were used to save the running program from the memory to disk. If the freezed program was reloaded from the disk, the program continued running from the point where it was frozen. Some crackers were disassembling games in order to save their musics as individual programs, making them playable without the game. They were called musicrippers. It wasn't an easy task, since the music was not stored as files, easy to locate, but were part of the programs, being routines themselves. The first musicripper was TMC, Charles Deenen, who later became founder of the famous musicgroup, Maniacs of Noise, and even later the audio director of Interplay. Non-Stop Cracker from Germany were also ripping music. Making cracker intros soon turned into a form of art. More and more advanced intros were made, and the first, primitive sprite animations were bypassed by lightyears by the end of 1986. Quality intros became a question of prestige and no elite groups were to allow poor ones any more for bad intros would ruin their reputation. But there was another field of competition. All groups were rushing to crack new programs as soon as possible, equip them with trainers, and spread the warez. The term of 0-day warez was introduced, meaning a piece of software that was cracked right on its release day. This required the crackers to acquire new programs fast. Fortunately there were plenty of companies throughout Europe, who delivered fresh games right on the first day with express courier. These companies were called suppliers. They usually did not know that a cracker group is receiving their parcels. Often members of different cracker groups got a job at these companies, to speed up their operations even more. Game developers soon got fed up with everybody copying their games indiscriminately, and added technical protection besides of the already existing legal one. For example, upon launching the program, a message appeared, asking for some information contained in the game's user manual. If the player was not able to answer, meaning that he didn't have the original manual, the program halted. Often they also made it impossible to copy the original disk. These protections were also removed by the crackers, and actually this circumvention of protection systems is what they call real cracking. Cracktro for Nobby the Aardvark from Illusion. It’s a tipical scroller cracktro. The two Illusion logos are scrolling infinitely looped, the red and the blue bars are “swinging”, and the text in the middle is a text scroller. The beginnings of the real cracker scene can be dated around the end of 1986. The first great groups were formed this time, wide communication between these groups was started, and elitism, the high quality standards of the underground subculture has appeared. Cracker groups became the cutting edge of the scene for plenty of years. Every little kid wanted to become a cracker someday, and literally hundreds of thousands knew and respected the greatest groups, the best known crackers. Let's see how they were favoured by fortune. Quality warez often got a quality disk cover. This one was designed by Alain of Fairlight in 1987. Cover design was another branch of cracker art.